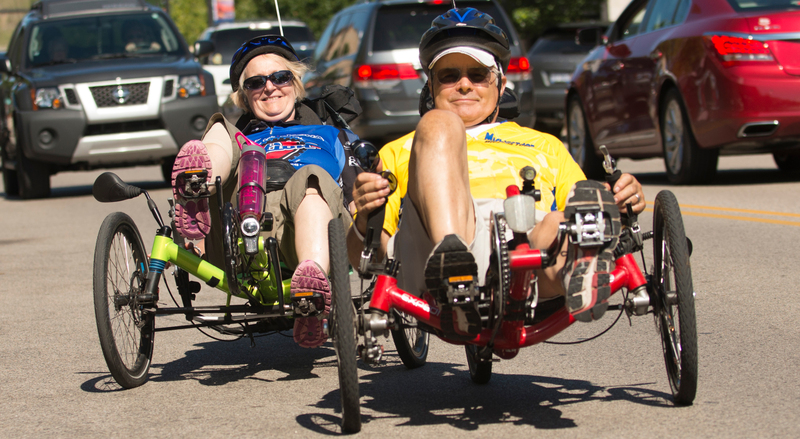 Old Town, Lansing, MI — Bicycling and trail advocates will gather at the Capitol on Wednesday, May 23 to meet with legislators to advocate for policies that help make Michigan a more bike-friendly state. Led by a consortium of like-minded organizations; League of Michigan Bicyclists (LMB), Michigan Trails and Greenways Alliance (MTGA), Michigan Mountain Biking Association (MMBA) and Programs to Educate All Cyclists (PEAC), the Lucinda Means Bicycle Advocacy Day was created in memory of and to continue the legacy of former LMB executive director, Lucinda Means, who worked tirelessly to advance bicycling and the interests of cyclists of all abilities across the state. The Advocacy Day is held during National Bike Month, which has showcased the many benefits of bicycling each May since 1956. As the popularity of cycling continues to grow, there is work to be done to advance a pro-bike policy and continue support for trail development. Michiganders that enjoy the roads, trails, or dirt single tracks are invited and encouraged to join LMB, MTGA, MMBA and PEAC for Lucinda Means Bicycle Advocacy Day to educate legislators on key policy issues to facilitate a bicycle-friendly state at the Michigan State Capital. Gaining support from lawmakers for SB 123 (Knezek), SB 124 (O’Brien), SB 170 (O’Brien), HB 4185 (Bizon), HB 4198 (Alexander), HB 4265 (Hughes) and HB 5003 (Schor). This bipartisan, bicameral roadway safety package is aimed at protecting Michigan bicyclists. The bills establish a safe passing standard and improve driver’s education by devoting more time to bicycle safety and awareness. Gain support for HB 5100, a bill that would clarify the definition of an obstructed license plate to ensure a bicycle rack or hitch mounted device is not grounds for a traffic stop. Seek prompt action on SJR O, SB 763, SB 931 and SB 932 to ensure monies from the Michigan Natural Resources Trust Fund continue to be used to conserve and develop public lands. Thank legislators for supporting our e-bike legislation signed into law in October. The event begins at 8:00 a.m. on the northeast lawn of the Michigan State Capitol. Representative Clemente of Wayne County will present a Bike Month Resolution at 9:15 a.m., followed by a presentation from Senator Warren (Washtenaw County) at 9:30 a.m. Senator Jones (Clinton, Eaton and Ingham Counties) and Representative Hughes (Muskegon County) will speak at 12:30 and 12:45 p.m. The cost of the event is $15, which includes a lunch on the lawn of the Capitol after legislative visits. To register, visit https://michigantrails.org/lucinda-means-bicycle-advocacy-day-may-23-2018/. The Lucinda Means Advocacy Day plays an essential role in shaping bicycling policies in Michigan. Past accomplishments include: Michigan Complete Streets law and the right turn signal victory. Come and be a part of the democratic process, support an active lifestyle for all people in Michigan and help create new trail funding opportunities while protecting current funding. Michigan’s legislators need to hear the bicyclists’ perspective on why sustainable non-motorized transportation funding is important to the people of Michigan today and in the future. Lucinda Means came to Michigan from California, where non-motorized transportation was integrated into their culture and saw the need to integrate it here. She took the opportunity to encourage legislators during her time as the Executive Director of the League of Michigan Bicyclists from 1997 to 2005 (until her untimely passing). She broke barriers by ensuring the Michigan Department of Transportation (MDOT) included non-motorized transportation in their planning and became a strong advocate and spokesperson to MDOT. Building relationships between people and organizations was her strong suit. Through the League of Michigan Bicyclists, she created a consortium that included the Michigan Mountain Biking Association and Michigan Trails and Greenways Alliance to assist with advocacy initiatives to shape non-motorized policy issues. Her additional outreach to local bicycling groups and clubs helped to increase awareness of these issues across the state and inspired advocacy which had never existed before her tenure.